Spring Clean Outs begin February 15th, 2019. Schedule yours today! Click this button to find out more! Just for a moment, close your eyes and imagine a winding stream flowing softly over the rocks, through small crevasses, cascading in gentle waterfalls listen for the soothing sound of the water . . . relax. Today, you don’t need to just imagine it. It could be yours to savor each and every day, in your own yard, in your own special place. Mechanical and Biological Filtration – In a closed water feature, you need both a mechanical filter to handle debris and a biological filter to handle the nutrients that feed the water. Pump and Plumbing – Re-circulation is essential to add oxygen to the water for fish and bacteria. In addition, re-circulating the water keeps it fresh and allows gases to escape. Liner and Underlayment – To maintain zero water loss, an impermeable membrane is mandatory for small water features (under 1,000 sq ft). A strong 45-mil EPDM liner is the best choice for most pond installations. Unlike concrete, it is easy to install and won’t crack. When covered with stone, it has a 40-year life expectancy. A woven needle punched underlayment forms a soft padding for the liner. Unlike newspapers, it is quick to install; unlike sand, it completely covers the vertical areas of the pond shelves; and unlike carpet padding, it allows gases to escape. Rocks and Gravel – The most underused elements in a pond ecosystem are rocks and gravel, which should be used to cover your liner completely. 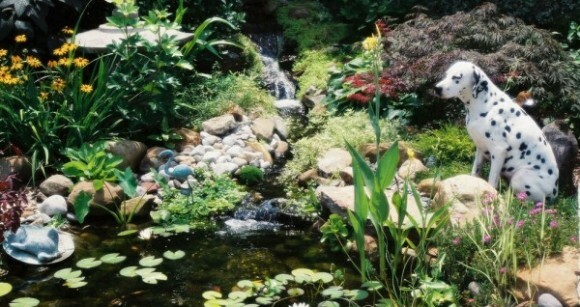 Adding rocks and gravel solves many traditional pond problems. Contrary to popular opinion, they reduce pond maintenance by providing surface area for bacteria to colonize. Fish waste and other organic matter that settle to the bottom of the pond are broken down naturally by the bacteria living there, keeping your water clear. Plants, Fish and Bacteria – Plants help to clean the pond by removing nutrients from the water for their own nourishment. Fish eat insects and in turn fertilize the plants. Bacteria eat the nutrients that feed green water and therefore keep the water clear. You Design It, You Create It, You Enjoy It!